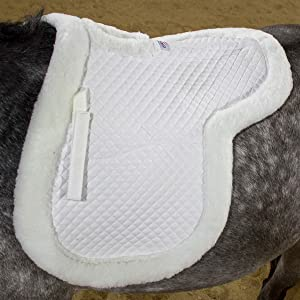 EXTRA COMFORT - this saddle pad features a soft plush half fleece lined underside, for gentle contact on your horse’s back. GENEROUSLY SIZED - the dimensions of this English saddle pad make for a great fit. The spine is 22” across, and the drop length from the spine is 24” to the end of the pad. ALL PURPOSE - this saddle pad is perfect to use as a show pad or daily schooling pad! Comes in black and white. Derby Originals caters to every equestrians needs by providing creative, innovative, and original equine products. 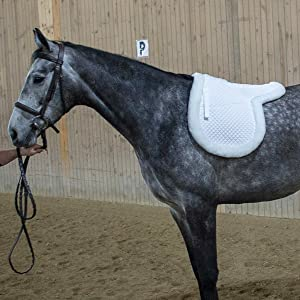 Derby’s line of English saddle pads are meticulously tested and tried by elite equestrians to ensure they stand up to and meet every demand of both horse and rider. Our goal is to make certain that horse and rider are able to achieve ultimate comfort so that every riding session is a fantastic experience. 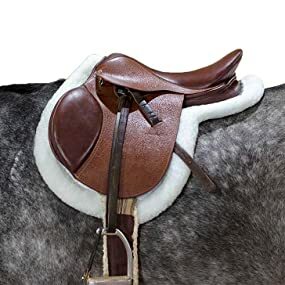 Derby Originals English saddle pads cater to the needs of every equestrian across all disciplines including every day riders and high end competitors. Say Goodbye to Sore Withers! Soothe your horses sensitive wither area during every ride with Derby Originals Wither Relief English Saddle Pad. This pad is designed with a fleece lined wither cut out to relieve any pinching and pressure from tack equipment. The classic contour design allows for this pad to be used for showing and every day schooling. Fleece lined, wither relief cut out for pressure relief. Half fleece lining featured on the underside of the pad. Diamond quilt pattern top and fleece edging for a classic look. Great to use as a show pad and daily schooling pad. This saddle pad features a fleece lined, wither cut out to relieve pressure caused by tack. This pad is a great fit for horses with large withers and upright head conformation. 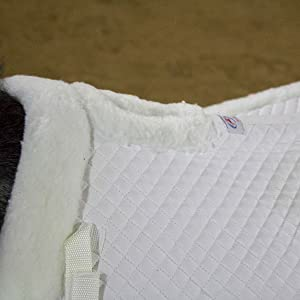 This pad features a classic, diamond quilted cotton top and fleece edging for a traditional English look that makes this pad great for a schooling and a show pad. Many riders prefer this pad because of its multi functional capabilities. Available in two traditional English colors: black and white.